NetApp has launched two new all-flash FAS arrays, won a top 3 SPC-1 storage benchmark result, and announced a new flash capacity guarantee programme. The all-flash FAS (AFF) A200 and A700s join the existing A300 and A700, which came into view in September. Place the A200 under the A300 on your mental NetApp AFF positioning map, with the A700s as a smaller version of the A700, fitting between it and the A300 to make a four-product range. All four systems run the Clustered ONTAP operating system and its associated suite of data management products. NetApp says the AFF products "can connect to public clouds from AWS, Azure, IBM Cloud and more, while retaining maximum visibility and seamless data control across cloud and on-premises environments". The entry-level A200 comes in a 2U rack enclosure with 24 front-mounted drives and a pair of controllers at the rear. 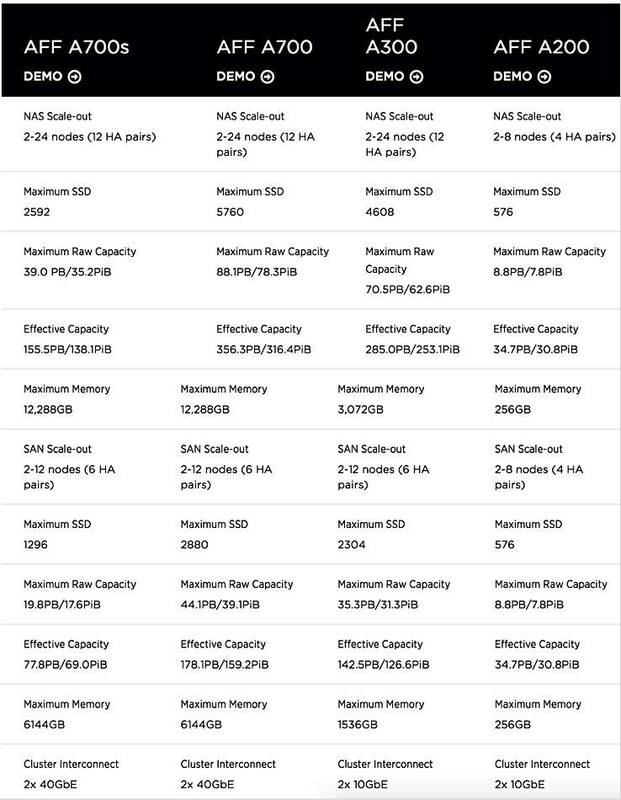 It scales from two to eight nodes (four high-availability pairs) in both SAN and filer mode (NAS Scale-out) with a maximum of 576 SSDs and 8.8PB of raw capacity, claimed to be 34.7PB effective capacity. The A700s comes in a 4U enclosure, which compares to the A700's 8U box +2U shelf, and it doesn't have expansion cards. It provides the same basic performance, however. NetApp says it can deliver more than 600,000 IOPS and 1PB of capacity in its four-rack units. Again, there are 24 front-mounted drives with the two controllers in the rear. In NAS mode it scales from 2 to 24 nodes (12 HA pairs) with a maximum of 2,592 SSDs. The larger A700 can take 5,760 SSDs. The A700s's maximum raw capacity is 39PB, meaning a 155.5PB effective capacity. Its maximum DRAM is 12.288TB, as with the A700. For comparison the A200 has just 256GB of DRAM. 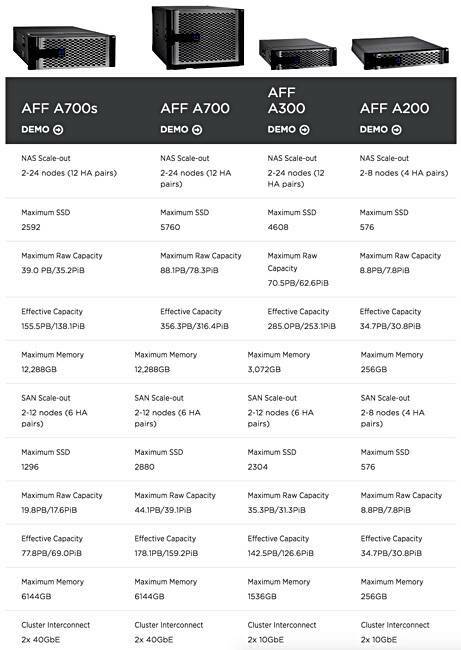 SAN scale-out mode for the A700s means from 2 to 12 nodes with a lower maximum SSD count of 1,296 and 19.9PB raw capacity (77.8PB effective). Two 40GbE cluster interconnects are supported. It supports 8 x 32Gbps Fibre Channel ports, not available on the A200, 8 x 16Gbps FC (as with the A200), but does not support FCoE target ports, which the A200 does. The A700 supports 64 of them. We understand that the A700s has hot-swap component modules and hot-add cards, with no need to failover controllers to insert a card. NetApp says it has a new All-Flash Guarantee for the entire AFF product family. It provides a workload-specific efficiency guarantee that scales up to a 5:1 data reduction ratio. Customers get the storage efficiency and capacity NetApp promises, or it will cover the costs to make up the difference. However, the previous guarantee was a 4:1 blanket guarantee which included snapshots. The new one does not. We understand that VDI environments get a 5:1 ratio, database workloads have a 2:1 ratio and virtualised servers have a 3:1 ratio. The AFF A700s achieved 2,400,059.26 SPC-1 IOPS at an average response time of 0.69 milliseconds. 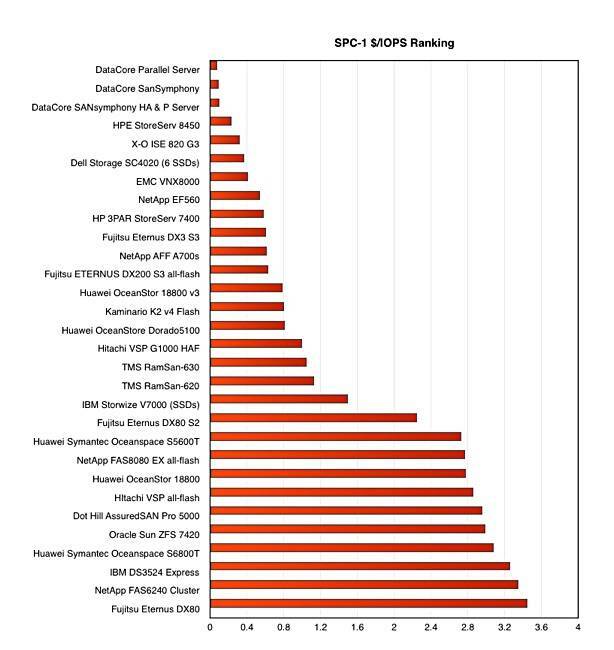 It is the top-performing enterprise all-flash array among the major storage providers and in the top three overall on the SPC-1 Performance list. A Huawei OceanStor 18800 V3 is number 2, scoring 3,010,007.37 IOPS at an average 0.92ms and a price/performance rating of $0.79. The A700s’ price/performance was better, at $0.62. A 2-node DataCore Parallel Server holds the SPC-1 record, scoring 5,120,098.98 SPC-01 IOPS with an average 0.28ms response time and $0.10 price performance rating. It did so with a pair of Lenovo X3650 M5 servers, a mix of SSDs and HDDs mounted internally and externally, and 1.54TB of DRAM for caching plus parallel IO-serving software having multiple CPU cores handle the IO. The A700s configuration in the benchmark featured a 12-node cluster (6 x 2-node HA pairs), each node having 512GB of DRAM/cache, meaning a total of 6TB DRAM. How would NetApp describe DataCore's SPC-1 result coming from a system costing $506,525.24 while the A700s was priced at $1,493,103.71? Roughly speaking that's NetApp offering half the DataCore performance for more than twice the price. Adam Fore, NetApp's director for product and solutions marketing, said: "We can't speculate on how DataCore got its results. However, in our view, comparing NetApp and DataCore's offerings is like comparing apples to oranges. 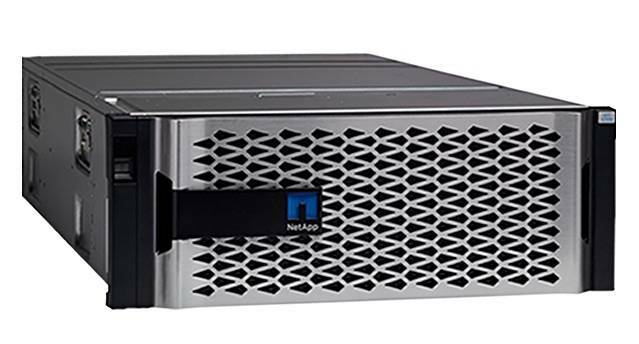 The NetApp AFF A700s brings the full suite of enterprise-grade data management and data protection that customers are looking for as they build out the cloud-connected data centre." The SPC-1 Benchmark is designed to be vendor/platform independent and are applicable across a broad range of storage configuration and topologies. Any vendor should be able to sponsor and publish an SPC-1 Result, provided their tested configuration satisfies the requirements of the SPC-1 benchmark specification. In effect NetApp says, yes, the DataCore system is faster and costs less but it doesn't run our proprietary software, and that makes it unsuitable for enterprises. It would be very interesting to see Dell EMC VMAX, Unity and XtremIO SPC-1 benchmarks, as well as ones for HPE's 3PAR, IBM's FlashSystems and also Pure's FlashArray. We're not holding our breath. The rate of AFF innovation looks high, and this leaves us wondering when a new generation SolidFire array, one designed and engineered under NetApp ownership of SolidFire, will emerge.